In 2016, 77 percent of Seattle voters passed Initiative 124, requiring hotels to provide workers with emergency panic buttons, keep lists of guests accused of assaulting or harassing workers and bar those guests in certain circumstances. 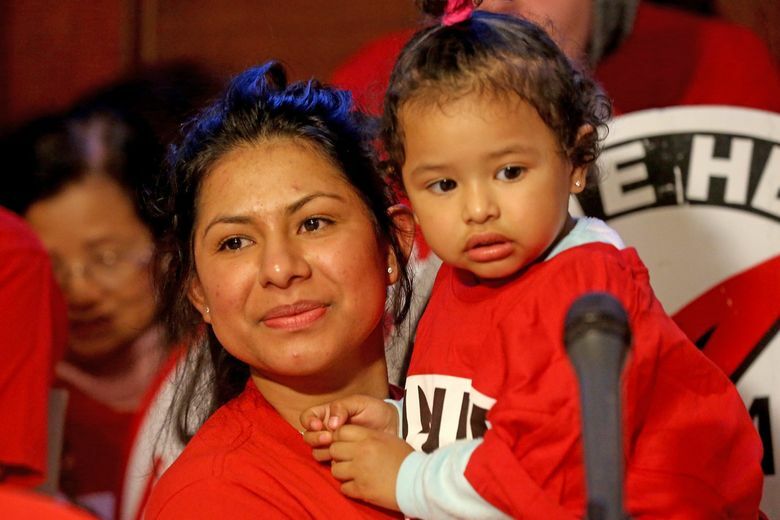 Seattle will ask the state Supreme Court to revive a voter-approved city law that gave new rights to hotel workers before being struck down last month. 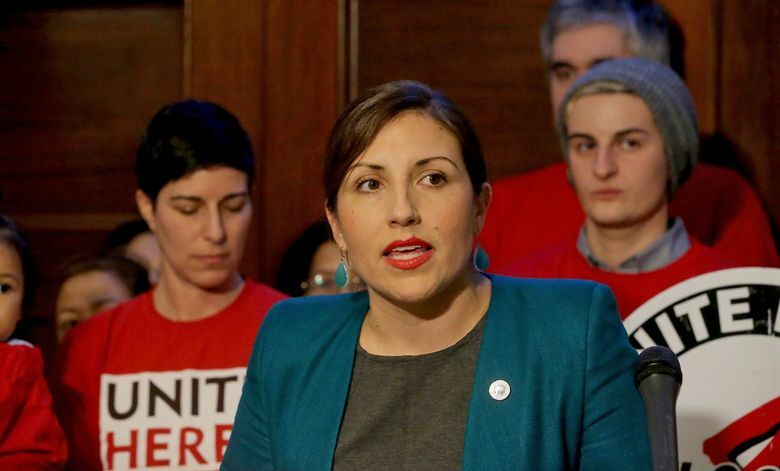 City Attorney Pete Holmes joined City Councilmember Teresa Mosqueda and union leaders at the Labor Temple to announce the plan Wednesday, vowing to fight for the law, which won overwhelming support at the ballot two years ago and inspired similar measures in cities such as Chicago and Oakland. 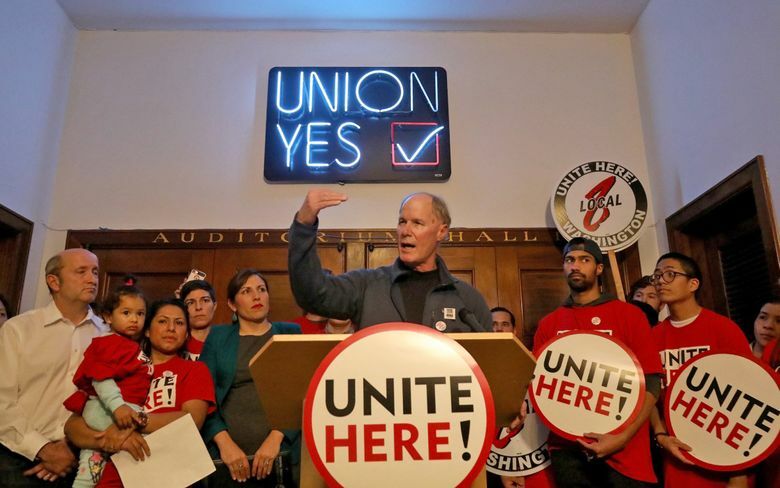 Drawn up by the Unite Here hotel-workers union and adopted with 77 percent of the vote in 2016, Initiative 124 required hotels to provide workers with emergency panic buttons, keep lists of guests accused of assaulting or harassing workers and bar those guests in certain circumstances. Proponents said I-124 would protect a workforce of mostly immigrants and women of color from sexual assault and harassment. The law also required hotels to safeguard workers from injuries, limit them to 5,000 square feet of cleaning each day, provide them with health-care coverage or subsidies and retain them as employees during ownership changes. The provisions not related to assault and harassment could be waived in collective-bargaining agreements. A King County Superior Court judge in 2017 dismissed a lawsuit brought by the American Hotel and Lodging Association, the Seattle Hotel Association and the Washington Hospitality Association, siding with the city. But on Christmas Eve, an appeals-court panel struck down the law. The three-judge panel said the 2016 ballot measure, by including provisions unrelated to each other, violated a rule that says initiatives put before voters can cover only one subject. Taylor said the case could carry national implications, as his union does battle with the industry across the country. “They want to take us on in Seattle here, because you set the trend,” he said. The appeals-court judges said they couldn’t determine whether any of I-124’s various provisions would have passed on their own. The single-subject rule is meant to prevent “logrolling” and “riding” strategies, when supporters of a certain policy win at the ballot by combining multiple measures that wouldn’t pass individually or by attaching unpopular legislation to popular legislation, the panel said. The Seattle Hotel Association hailed the decision, saying I-124 impeded the industry’s ability to manage its workforce while violating the rights of its customers. But Holmes says the appeals-court judges were mistaken. Each provision in the law was related to the well-being of hotel workers, he said Wednesday. In a statement, Mayor Jenny Durkan backed the city attorney’s plan. With I-124 invalidated for now, Durkan said she intends to work with the council on new legislation to protect hotel workers. Many local hotels began using panic buttons before I-124 passed, the Seattle Hotel Association said in a statement Thursday responding to the city’s announcement. “We continue to fight because of other items in the law, like the blacklist that violates the due process rights of our guests,” the association said.